Beat the butter, milk, vanilla extract and half the icing sugar until smooth. 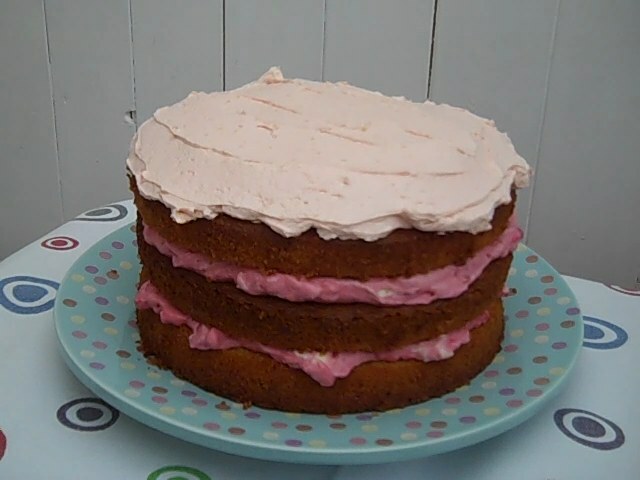 Gradually add the rest of the icing sugar, beating until buttercream is smooth and creamy. Add food colouring, carefully, only 1 drop at a time and beating well after each addition, until you get the colour you want. Remove the parchment paper from one of the cakes and spread with strawberry jam. Remove the parchment paper from the other cake and spread on some of the buttercream then sandwich the two together. Spread a little buttercream on a cake board and place the cake onto it (this will stop the cake moving). I’ve used Kit Kat Bites around the side but you can use whatever you prefer. Spread a little buttercream on each and stick them to around the side of the cake, leaving a small gap for the chocolate eggs to fall down. Spread buttercream all over the top of the cake. I then left it for 1 day to harden slightly before adding a mixture of Cadbury’s Mini Eggs and Galaxy Golden Eggs. I then put a small dab of buttercream on a few eggs and placed them onto the cake to give the look of the eggs overflowing.